The last day of CPA board exam was October 12, 2014 which also known as October 2014 Certified Public Accountant Board Exam. The Professional Regulation Commission announced the Certified Public Accountant Licensure Examination Results on October 15, 2014. The Board of Accountancy given the exam in the cities of Manila, Baguio, Cagayan de Oro, Cebu, Davao, Iloilo, Legazpi, Lucena and Tacloban this October 2014. The chairman of the board is Mr. Joel L. Tan-Torres, together with the members Betty C. Siy-Yap, Vice Chairman; Eliseo A. Aurellado and Gerard B. Sanvictores. The Certified Public Accountant Licensure Examination was held every Saturday and Sunday of the month, which was scheduled on October 4,5,11 and 12, 2014. 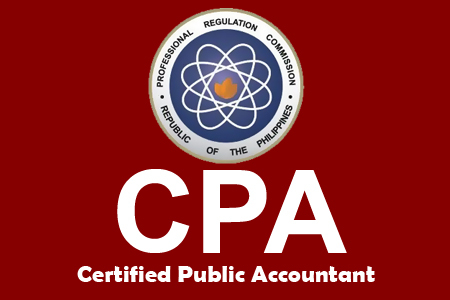 Last July of this year, PRC announced on Friday, August 1, the 1,107 new CPA board passers out of the 5,540 examinees of Certified Public Accountant Licensure Exam. The roll of successful passers for the October 2014 Certified Public Accountant Licensure Examination will be displayed here. NOTE: To help you find your name easily, follow this command: Press and Hold the key "Ctrl + F" then type your Full Name and press ENTER. Held on OCTOBER 4, 2014 FF. CPA board exam subjects are General Instructions/Filling up of Forms, Theory of Accounts, and Auditing Theory on the first day, then on the second day are Management Services and Practical Accounting. For the fourth day, the subjects of their exam are Auditing Problem, and Practical Accounting Problems II, and on the last day of examination, the Business Law & Taxation subjects. For more information about CPA Board Exam Results October 2014, kindly bookmark this page and share to your joined social networking sites. Comments or suggestions about " Philippines CPA Board Passers October 2014 - Certified Public Accountant Board Exam Results" is important to us, you may share it by using the comment box below.